Conveniently located in the heart Youlgreave village in the Peak District National Park. Dawson's Cottage is a high quality barn conversion and spacious for two people. There is an upstairs dressing room off the main bedroom, ensuite wc and shower room as well as a main downstairs bathroom with w.c. and bath. There is outside seating for two and off road carparking for one car. Your well behaved pets are most welcome. 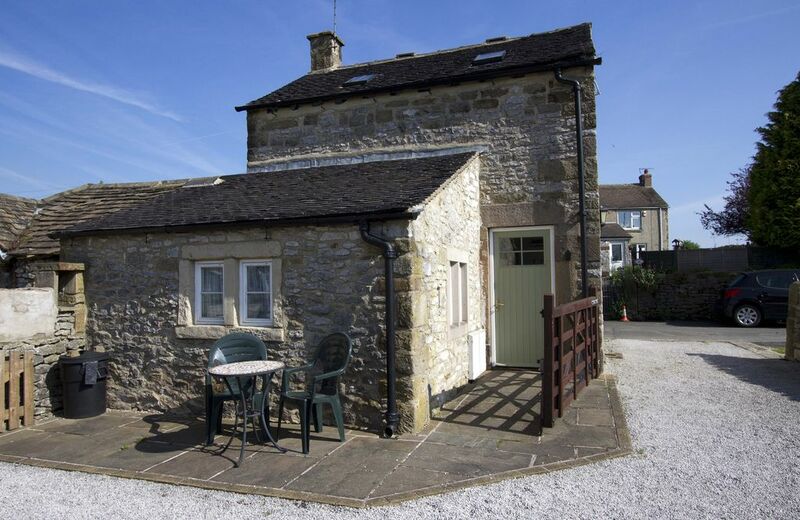 The cottage is located a short drive from the popular trourist attractions of Chatsworth, Haddon Hall and Bakewell. toilet, tub, The main bathroom is downstairs. toilet, shower, Ensuite to the bedroom is a wc and shower. En suite shower and wc to the main bedroom plus downstairs bathroom with bath and wc. The cottage is central heated via a thermostat in the sitting room. There is a stone fire surround and electric coal effect fire. There is off street parking to the rear of the cottage for one car. Complimentary wifi is available throughout the cottage. The living room has two comfortable leather sofas, coal effect electric fire and TV / DVD player. The well equipped kitchen has cooker, hob, dishwasher and dining for 2. You will find the kitchen very well equipped to include all the day to day crockery and utensils that you will need during your stay. There is a dining table and chairs in the kitchen which can be either open plan to the sitting room or closed off via glass doors. There is a small outside area with table and chairs for two. There are several golf courses nearby, the closest of which is located at Bakewell which is about 3 miles away. Cleaning / Towels / Linen All utilities, towels, linen and the final clean are included in the published rates. The only additional charge that we make are for pets which are £20 per pet. The cottage was well equipped, clean and comfortable in a nice quiet village. Bakewell was a 10 minute drive away and Matlock Bath was about 30 minutes away. We would use the cottage again and recommend it as a great quiet retreat. Thank you for your review. We are delighted that you enjoyed your stay at Dawson’s Cottage and we hope to see you again soon. Smaller inside than anticipated but very nicely decorated with lots of well thought out touches. We have a large car so parking was a bit tight , mainly because of one of the locals parking a big van across the tight road opposite the gateway . We found the living room was just right. The bed was so comfortable we didn't want to get out in the morning. The heating worked well and the boiler provided the hot water ok. Not used to electric showers now but it did the job. There is also the option of a bath which was welcome after a long walk. The village is nice and quiet and friendly. Would love to come back again sometime in the future. Thank you for your great review, we're delighted that you enjoyed your Valentines stay at Dawson's Cottage and we look forward to welcoming you back again soon. Fabulous, cosy cottage in beautiful surroundings! Wonderfully homely cottage with everything you need for a comfortable and relaxing break. Beautifully located in a great spot. Cottage was well equipped, super clean and nice and cosy on a cold and snowy weekend in January! Thank you very much for the great review of your stay at Dawson's Cottage, thank you for taking the time to write it. We are delighted that you liked the cottage and the area and we hope to welcome you back again soon. We had a lovely break in Dawson’s Cottage over New Year, great location. Hi Sheila, thank you for your review, we are delighted that you enjoyed your stay at Dawson's Cottage and we hope to welcome you back soon. Immaculately clean and cosy in the lovely village of Youlgreave. The cottage is ideally located for walking, rambling, cycling and visiting the many delights of the Peak District. Manchester and East Midlands airports are the closest major airports. The cottage is conveniently locates within easy strolling distance of the 3 village pubs, the Post Office / general store and there is also a local cake / coffee shop. Booking Notes: For all weekly breaks we ask for £100 deposit with the balance payable 6 weeks prior to the start of your holiday. For all shorter breaks we ask for full payment at the time of booking. Following your booking we will hold all dates for 4 days to allow postage time for the return of your booking form and payment. Please do still enquire even if the availability calendar is showing as booked for your dates as we have other cottages in the village which may suit your requirements. Changeover Day: We aim to be as flexible as possible with regard to change over day. Check in is any time after 3pm and check out by 10am to allow for cleaning of the cottage. Notes on prices: All rates are inclusive of utilities, towels, linen and the final clean. The only additional charge that we make is for pets which are charged at £20 per pet. We accept a maximum of two pets.